Pool decks can be a great part of the home, but they can also be dangerous if they’re made out of the wrong material. Decorative concrete can also be slip resistance to ensure the safety of those who are visiting your home—as well as your own family. This addition means having the highest quality and strongest material installed. You can also have it waterproofed to prevent serious long-term issues that other materials often encounter. Call today and speak with our experts about the services you want. You have a number of options for pool deck surfaces, including poured-in-place concrete, concrete pavers, stone, brick, tile and wood. Concrete pool decks give you the most design flexibility in terms of color, texture and pattern. Concrete allows you to easily design your pool deck to blend in with your home's exterior design and surrounding landscaping. You can also stamp and texture concrete to mimic other pool deck materials such as stone, brick and even wood. Let us help you turn your pool area into the focal point of your backyard! Stamped concrete creates beautiful and aesthetically pleasing pool decks that resemble natural slate, flagstone or brick. Colored and stained concrete usually goes hand in hand with stamped concrete, allowing you to replicate the colors of natural stone and other materials. 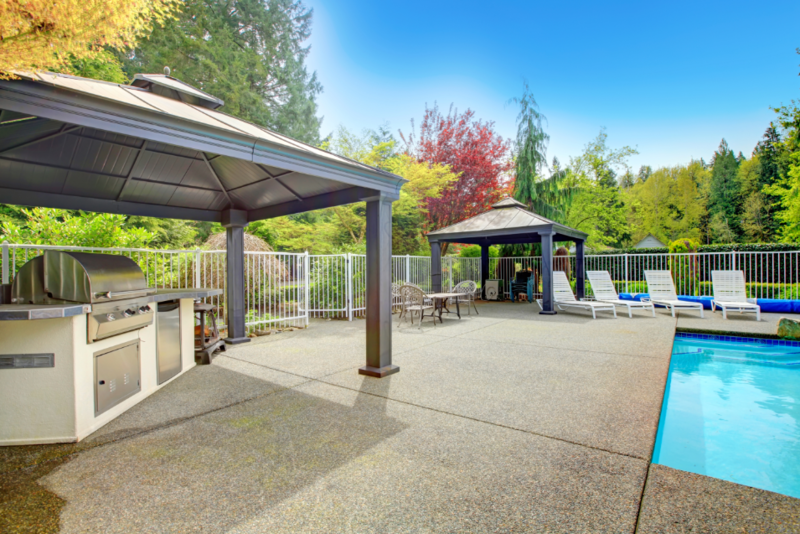 Lighter colors are usually preferred for pool decks because they reflect UV rays and keep the surface cooler. Stenciling a concrete pool deck can be a great alternative to decorative stamping while still permitting similar design flexibility. Concrete stenciling uses disposable paper stencils to imprint brick or stone patterns in freshly poured concrete. Applying a dry-shake color hardener or stain to the exposed concrete before stencil removal will give the appearance of individual stones or bricks that have been mortared together. Stencils for concrete come in a wide array of patterns, ranging from brick to stone, slate and tile. A rock salt finish is a low-cost, easy method for adding subtle texture and slip resistance to plain or colored concrete pool decks. This look is created by pressing grains of rock salt into freshly placed concrete then washing them away. The result is a beautiful and unique speckled pattern on the concrete surface, similar to the appearance of slightly pitted, weathered rock. 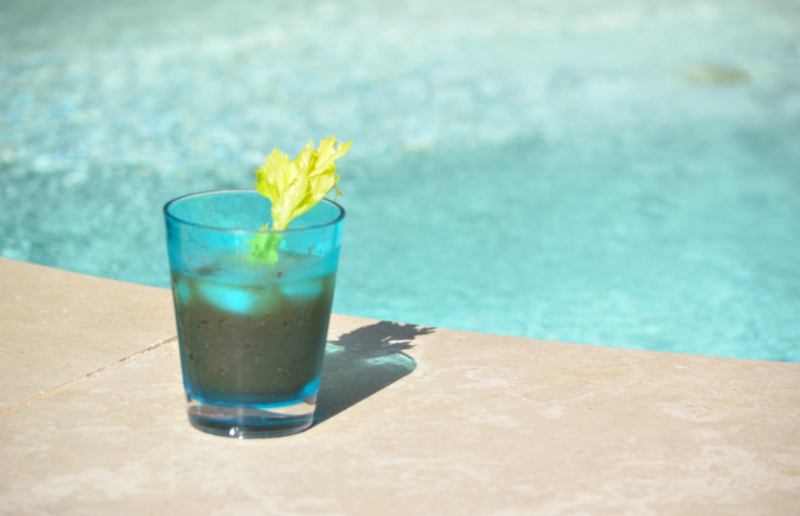 ​Exposing the aggregate in concrete produces a pebble-like finish that creates a highly slip resistant option for your pool deck. This finish option allows you to create a custom look and comes in an assortment of colors and sizes. The process that we follow is pretty uniform regardless of the job that we do. We start with a conversation and with an inspection, then we will present to you a proposal and offer our thoughts and our plans. You can then reflect on it and gather your own thoughts. Once everything has been agreed, including time frames and (cheap) prices, we get started on your custom pool deck project! ​Our Service Promise to You! When it comes to our services, the choice is yours, it is as simple as that. Whichever material or pool deck design you want, whichever sub-category of material, we are there to provide it. We are here to to help you design the perfect pool deck to complement your backyard design. If it is a particular type of design that you are after, we will be able to provide it. We are here to make sure that you are happy at the end of the day and that you have a beautiful pool deck area that you are proud to show off to your friends and neighbors.